Bags of makeup, we like (okay, LOVE). Bags underneath your eyes, however, that’s a definite no-no. Erase the signs of your all-nighter by simply referring to your kitchen or eye creams as a solution. We’ve got the best immediate and on-the-go cures to your puffy, sensitive eye woes… sans makeup! So, give that concealer a break and opt in for one of these quick fixes. 1. Ice-Ice-Baby: Depuff in a pinch with nothing but ice — that, and a paper towel or thin washcloth. Wrap an ice cube in the towel and gently rub it underneath your eyes for instant relief from swelling and dark circles. No one at work will know that you’ve only had a few hours of sleep! 2. Time for Tea (Bags): We don’t just love drinking this stuff! Soak either green tea or black tea bags in hot water for a few minutes, then take them out to cool. 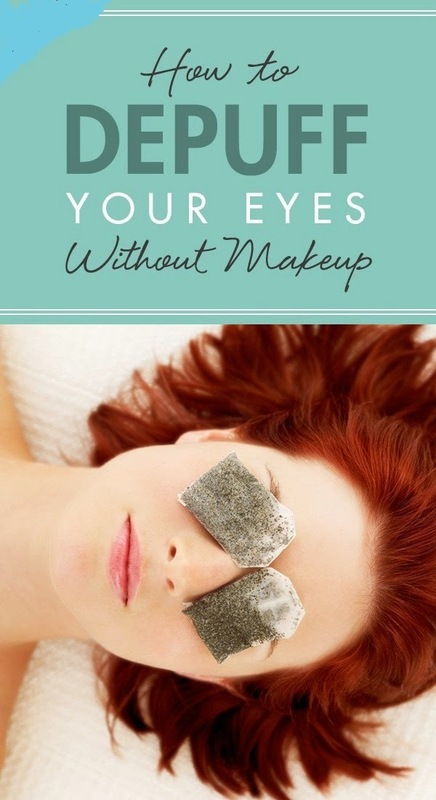 Lie down and place the tea bags on your closed eyelids for 10-minutes to relieve those eye bags! 3. Frozen Spoons: Notice those puffy peepers while getting ready in the AM? Put two spoons in the freezer while you get ready for your day and once they’re cold, glide them underneath your eyes from the inner to outer corners to drain away fluid and cool the eye area for a refreshing feel! For those extra puffy days when your kitchen just can’t make the cut, try an instant-relief eye treatment that’s meant to soothe and reduce inflammation through cooling effects and calming ingredients like aloe vera, thermal water, cucumber…and caffeine to instantly perk up those eyes and fight fatigue!